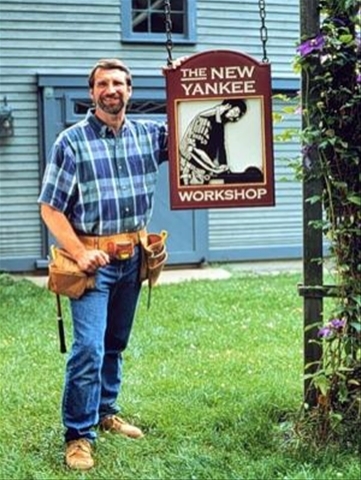 Of the three I think The New Yankee Workshop is probably my favorite. For those unfamiliar with the show, each week master carpenter Norm Abram takes on a new wood working project that is both beautiful and functional. Some of the things he says though lead me to believe that Norm Abram would make a great programmer. Norm starts every episode with a prototype piece. He uses it to work out the kinks of the project he’s building. He refers to the prototype while he builds the main project, shows you what he did. How much better could your programming project be if you created a prototype before starting your main project. Norm understands that so many times it’s the small details that make the difference in the success of your project. I can’t tell you the number of times I go use an app and try to tab to the next field and instead my cursor jumps elsewhere. Small oversights like not setting correct tab order can really make an impact on how your application is perceived. Norm’s great at multitasking. When he gets to a point where he has to stop working on something, he has something else ready for his attention. How often have you gotten stuck, waiting on a DBA to make a change, or someone to supply critical information? Always have a backup plan, something else you are ready to work on while you wait. Frequently during the project development Norm will fit the pieces together, without glue, just to be sure they are going to fit together. In the software world this clearly parallels the concept of continuous integration. Check in your code regularly, do daily (if not more often) builds to make sure everything will fit together. Norm has tools. A lot of tools. He’s got a huge drawer with nothing but routers! The point is, he uses the right tool for the job. Make sure your coding toolbox is well equipped. I don’t know any .Net coder who can use just Visual Studio to get his job done. Check out add-ins, third party components, etc. to make sure your toolbox is full. When Norm can’t buy the tool he needs, he builds it. Over the years he’s shown how to build many types of jigs in his workshop. If you can’t find an add-in or control that does what you want, build your own. Take time to learn how to write macros, Visual Studio Add-Ins, or your own reusable controls and code libraries. Like Norm you’ll use these tools over and over. Norm starts each show with the classic warning to be careful. Visual Studio is one of, if not the most powerful programming tools around. Take some time to learn how to use it. Spend an afternoon and go through all the menus. Use online help to look up the commands you aren’t familiar with. You’ll save yourself a lot of effort by investing a few minutes in learning the commands available to you. Norm reminds us each week of the importance of safety. While I’m not likely to cut off a finger or poke out an eye using a mouse, it is important to remember to use your computer safely. Take breaks about once an hour. Get up and move around. Save your eyes, look up from your monitor, glance out a window. Flex your hands, move them around. I don’t know how many times I’ve been doing some heads down coding, not realizing 3 hours had flown by until I took that sip of cold coffee (yuck!). Not good though, my back gets stiff and eyes get tired. Listen to Norm, wear your safety glasses. Each week Norm uses his creative skills to craft a beautiful, yet functional item out of wood. As developers, we (hopefully) craft (and I do think coding is a craft) beautiful yet functional applications for people to use. Norm would have made a great programmer. I’m just glad he sticks to wood working, I don’t think I could handle the competition. Previous PostArcane Thoughts: Tips for Daily BloggingNext PostSQL Server Compact Edition To Be Shipped With Windows Mobile 6.0! Steven, I stumbled across your blog (Dougal sent me). Being an IT director, I’ve enjoyed your insights.